Baby BJ was 11 days old last Friday so we had a ceremony held for him called Nwaran. 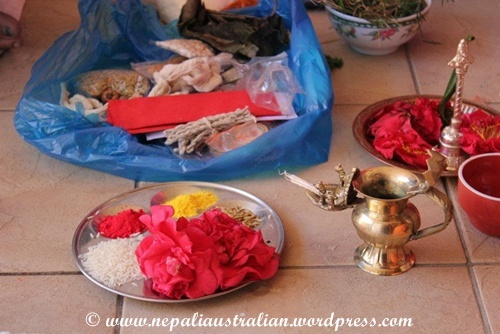 The ceremony is also known as Machabu Byakegu in Newari. It takes place on the 11th day from birth. 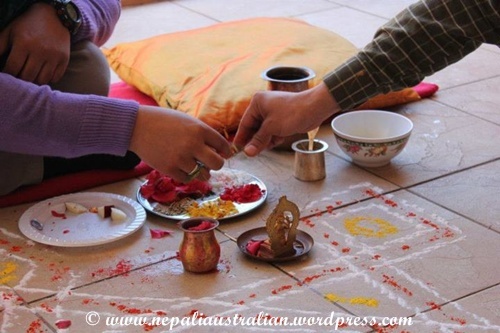 This ceremony is performed to give a birth name to a child according to his/her lunar horoscope, this is usually not the name by which he/she will be known. This ceremony is normally small and celebrated amongst close family. We are lucky to have a friend who is also a priest. He gave us a list of things that are required for the day and everything was ready when he arrived at my brother’s place at 8.30 am. The main ceremony was conducted in the balcony of my brother’s apartment. 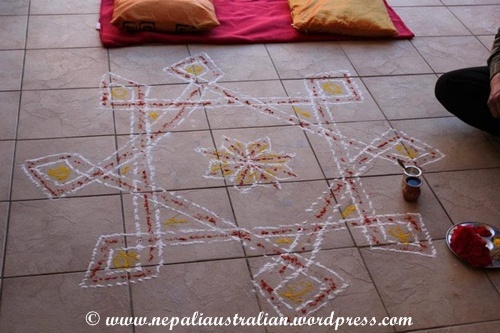 Before the priest arrived we had cleaned and mopped the place. So, when he arrived, he started making a Mandap on the balcony. Once it was ready he asked my brother to come and join him for the Puja. 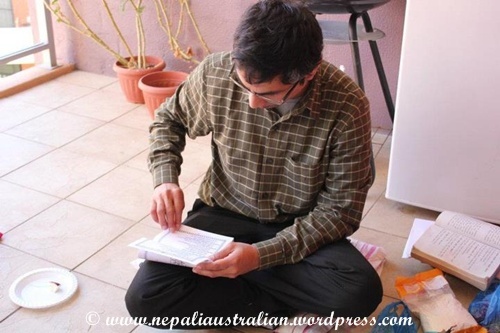 He had all his books of mantras and it took more than an hour for the first phase of the Puja to finish. 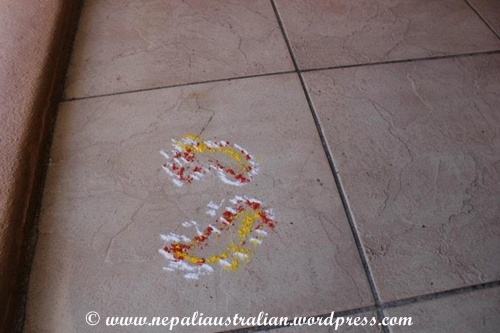 It involved lots of mantra reciting from the books and lots of different Pujas to God, with candles on the Mandap. Then he asked my Sister in law and Baby BJ to join the Puja. He chanted more mantras from the book. 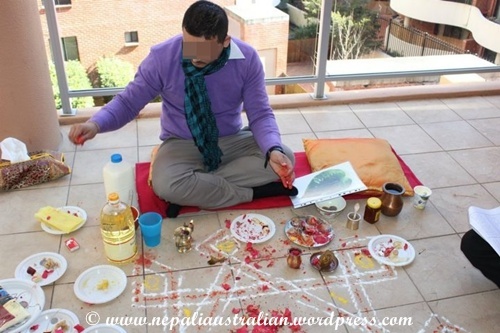 Then he asked my SIL to perform Puja to the sun. Then he put tika on Baby BJ’s forehead and gave him a piece of paper which had details required to make his Jaata (lunar horoscope chart). It will be done by my parents in Nepal. Then we took little BJ for Surya Darshan, i.e. to let the sunray fall on him as a blessing. He was also given a holy cloth with his birth name written on it. Then he put Tika on my brother, SIL and then the rest of us. He also put Janai (holy string) around our wrists. After that all of us put Tika on baby BJ as our blessings. 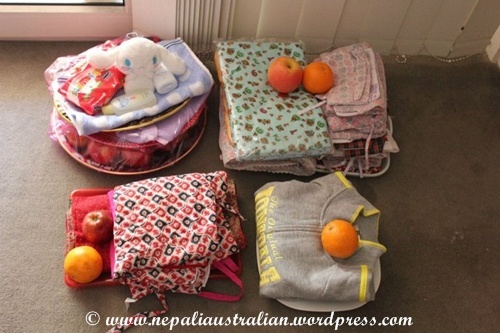 Little BJ got lots of gifts from all of us, mainly clothes and toys. After the Puja was concluded we had our morning brunch. 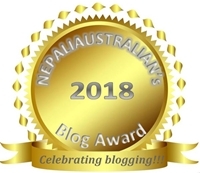 This entry was posted in Family, Nepali Culture, Newari Culture and tagged Annaprashan, baptism ceremony, Chhaithi, dubo ko mala, golden threads, horoscope chart, junko, Macha Junko, machabu-byakegu, Mandap, motherhood, newari, Nwaran, Nwaran and Pasni, Pasni. Bookmark the permalink. I love that you bring these elements of your cultural heritage with you and embrace them. Bravo.